So today I have something to share with you that will again touch upon a topic that is a struggle that I've been dealing with for quite some time now: ACNE. I know many of you may think that acne is something that only teenagers deal with but it's actually something that has been very up-and-down for me (mostly down) for the last 16 years. It may seem like I have very nice skin in my videos but there is a lot that can be said for lighting and glow, the latter coming from meticulously taking care of my skin since I was young, throughout the good and bad. So to give you an update on my current skin condition, it is combination, sensitive, and acne-prone meaning that changes in hormones (like switching birth controls), weather, traveling & work-related stress, proper sleep, or skipping washing my face can all lead to a lovely few breakouts. After a few of these events combined 3 months ago, my skin went really unbalanced and I had some uninvited cystic bumps covering my cheeks, chin, and sides of my mouth. Ouch, super painful. Here are my thoughts on the product! Basically, the Perfectawash is a face wash system that comes with a hands-free dispenser and 2 face wash scents, Superfruit Splash (pink) and Soothing Plant Extracts (green). It contains 2% Salicylic Acid which I will say in high school did nothing to help my acne but nowdays is my acne fighter of choice. It's the same ingredient that is the super acne fighter in my beloved Mario Badescu Drying Lotion and I actually do see results with it more so than Benzoyl Peroxide which tends to dry out my skin and bleach my towels and clothes. I don't want to repeat everything I said in the video here, but to make a long story short, over the month that I have been using it, my skin has steadily been improving so I really do think this face wash has been helping over my non-acne-fighting washes that I've been testing out lately. It also doesn't strip my skin of moisture and the hands-free dispenser, which may seem gimmicky to some, actually does look quite nice and is hygienic and fun to use. At $19.99 for two 5oz washes plus the dispenser, the kit is a pretty good deal and refills will retail at $8.99. The kit will be sold at here starting December 26th and I believe will be at other retailers next year as well. 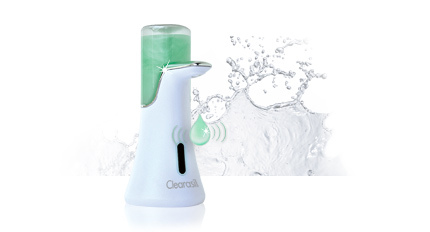 If you would like to be entered into the giveaway for one of these Clearasil Perfectawashes, please leave a message in the Youtube comments letting me know what your biggest skin concern is. There will be 5 winners randomly selected and the giveaway is for the US only, ending in 1 week. Readers, what is your greatest skin concern? Acne? Eczema? Blackheads? Let me know in the comments! Wow, I really like the dispenser! I can't wait to try this. I never had acne as a teenager but recently changing hormones have left my jaw line unsightly and quite embarrassing! I hope this will help. My skin isn't sensitive, so I enjoy using Cetaphil as my cleanser. Will this work on my skin that's actually not acne-prone? and can we just use this for everyday face wash? My biggest skin concern is Rosacea. It's a nightmare and didn't start effecting me until late in my 20's. I am now in my early 30's and suffer from flushed skin, broken capillaries and incessant bumps. It is an utter nightmare! I have recently started having hormonal acne and have always had horribly clogged pores on my nose. Disgusting. I felt obliged to tell you how fantastic that cardigan looks on you! Perfect color! I have some blackheads and PMS acnes, but since I don't live in the US I can't take part in the giveaway *sad look*! i am wondering if this regiment would work on one's back? i unfortunately suffer from back-ne! i also have a lot of scarring, which unfortunately takes a long time to go away on the back because it does not have as much oils as on one's face. My biggest skin concern is blackheads. Blackheads will later get infected to be acne. I love reading your post on skin care especially. I just wanted to tell you that I'm so thankful that you don't only show your videos but also write a post about the main things you mentioned! That's important for me because I have a hearing impairment and it's often very hard for me to understand what you say in your videos but as long as I can read what you mainly talked about I feel like I'm finally able to get what you say! Thank you so much for this really can't be seen that often and most times I end up not watching beauty videos because I don't understand aurally what was said. I've had acne for a long time now! what do you use to cover up acne scars/hyper pigmentation? Also, have you considered going off birth control and trying an IUD instead? Recently, I just did, and I've seen a huge great difference in my body being chemically hormone free! Thanks for this blogpost! I have been looking for a new facewash since as of late my skin has seemed to become acustomed to my clinigue acne solutions. I am anticipating giving this a try! hi Jen, LOVE your make up!!!!! !is there a chance you can talk about what mascara do you think great for asian short and stuborn eyelashes?!?! please merry Xmas! concerns... nodular acne :( been suffering from it for almost 5 years now.. and I didnt even realise I had it until a few months ago! Always thought it was my hormones acting up during teenage years but after hitting 20.. it just kept getting worse and I finally went to see a dermatologist who put me on accutane. Long journey ahead for sure, but i don't want to be a slave to skin problems my whole life! so persevere we all must! Always thought it was a "normal" thing to not want to go out because I had bad skin - for fear of being seen or fear of my skin getting worse when I put makeup to conceal it. And I've only just really realised how much it affected my life - socially and personally. I really did feel like a slave to my skin. My biggest concern in cystic acne that coincides with eczema. I have yet to find a good cleanser but, am currently using Murad in combination with a clairsonic brush. But, I am also always on the look out for a new product. If you haven't tried the clairsonic yet I highly recommend it for black heads and removal of dry flaky skin. Unfortunately my acne started after age 25. It seems rather unfair to have to deal with it as an adult. I have acne-prone skin (even as an adult, *sigh*) coupled with dry, flaky parts and over the past two weeks since I started using the Shielo Complexion Products (Both the Shielo Complexion Moisturizer & the Shielo Complexion Scrub) this morning and night after I wash my face, my skin has really evened out. The flaky parts are gone. My pores are smaller on my cheeks. Acne scars and hyperpigmented areas have started to fade. I have not had a single zit for the past two weeks. This is insane. And my skin is so smooth! I noticed the smoothness after the first day. I watch your videos from some time and I didn't see you try any Snail creams. I read that they work miracles for every skin. I'm using one (Mizon snail recovery gel) and I can recomend it really works. Hi Jen, thanks for sharing your review about clearasil. I also find this product one of the most effective acne remedies in the market. Glad you have also shared the video on youtube which is very helpful for consumers whether they'll be going to buy that product or not. check this blog of mine too.